Majority of the users were satisfied by the good and comfortable fitting of the Terraclaw 220. This shoe had an impressive design as noted in some reviews. It features the Dual-C sticky rubber outsole for optimum grip. The diagonally sewn tongue to keep foot protected from rocks and debris gained positive impression from most runners. The Inov-8 Terraclaw 22 offers added drainage in the upper for more breathability and comfort. The Inov-8 Terraclaw 220 is a lightweight and affordable running companion. It has been applauded by most runners because it is very lightweight, comfortable and versatile. It is a great trail running shoe that offers a combination of performance and protection. It is ideal for racing and moderately technical trails. Starting off with the design, the Inov-8 Terraclaw 220 comes in blue/light blue with orange contrast, and a black with dark red contrast. The black model, in particular, is very stylish and has won several design awards. The tongue is special; it is asymmetrical turning inwards instead of straight down to your toes. At first, it looks weird - but after a while, you learn to appreciate it. When it comes to looks, the Terraclaw 220 is without a doubt the favorite in my current arsenal. I'll categorize Terraclaw 220 as a semi-all-round trail shoe, with one leg in the racing flat end of the spectrum. They are light, low stack, small drop (4 mm) and true to size with plenty of room to wiggle your toes. The asymmetrical tongue adds to the comfort because it works well at redistributing the tightness across the instep (at least for me). They are a bit cumbersome to put on as they require more-than-normal untying before you are able to slide your foot in. Once on your feet and tightened, the shoes will stay exactly where they are - more so than normal. With usage, your shoes will start to widen in the toe-box area. You'll probably find yourself unable to tighten the laces properly over the metatarsals. This will be annoying to some people. I don't mind too much as I prefer an open toe box and thick socks (e.g. Thorlo Experia). If you read the official description, there are all sorts of weird inventions and various compounds going into the sole. In my experience, its all a bit theoretical, and I put it down mostly as marketing gimmicks. There are some decently sized and spaced lugs, which will give you some traction on soft and reasonably flat tracks, as well as on rocks where they work well. On sandy and muddy sections, you'll survive, but it's not recommended either on roads. The 220 got no rock-plate so to some extent "you feel the track", which I find nice. What is annoying is variations in the rigidity of the two compounds that make up the sole. If you hit a hard object along the edges or on the heel (red sections) you'll just notice it. If you hit it with the center of the forefoot (black sections), it will push straight through to the soft tissue between the first and second metatarsals. Man, that hurts! I have more than once hurt my feet on pebbles while running on gravel roads. Once I even had to walk home and take a few days off running. The spacious upper is made of a nice, soft open weave fabric, which keeps your feet well ventilated. They are excellent for dry summertime runs on tracks and road-to-track type stuff. The open weave, however, lets in fine-grained sand/grit and water easily. The water leaves quickly too, but the sand stays behind. Most of my runs are in coastal areas with plenty of sand (dunes) around, and even with gaiters on I am able to restock the kid's sandbox with about half a cup of sand after each run. There is a wee bit of toe bumper to shield your feet - but nothing that will give any real protection should you venture up/down mountains or riverbeds. The Terraclaw 220 is categorized by many reviewers as the racing flat version of the Inov-8 Terraclaw 250. They are right; its a lightweight and fast shoe. On average my runs in Terraclaw 220 has been 5-10 seconds faster than my general average. However, that may well be because I only use the Terraclaws on lighter trails, thus penalize (speed-comparison-wise) my more rugged trail shoes who take the brunt of the muddy mountainous slow runs. I have used my Terraclaw 220 for road-to-trail type runs up to 20+ km, and I wouldn't mind going further than that. It is quite comfortable - also in the long run. My first pair is right now at 760 km and about to retire - mind you I have also used them a bit for normal wear (walking and at work). There is a fair amount of wear on the outsoles, not so much the upper. The main reason for retiring my 220s is the inconsistent sole rigidity, which has increased with milage. I simply don't dare run in them anymore for fear of injuring my feet. I got a second pair very cheap on sale a few months back - otherwise, I'd probably not buy another pair of Terraclaws. The Inov-8 Terraclaw 220 is a very nice looking and comfortable shoe with a somewhat limited usage spectrum. Fast and perfect for easy trail runs in dry conditions. Not my first choice for wet/muddy/sandy trails, nor rugged/technical and roads. They let sand, grit, and water in very easily, and the inconsistent sole rigidity is annoying bordering on "deal breaker". I like the novel asymmetrical tongue both design and comfort wise, but it's not for everyone, and it certainly requires "getting used to". They then may well use the 250 for longer training runs or longer races. 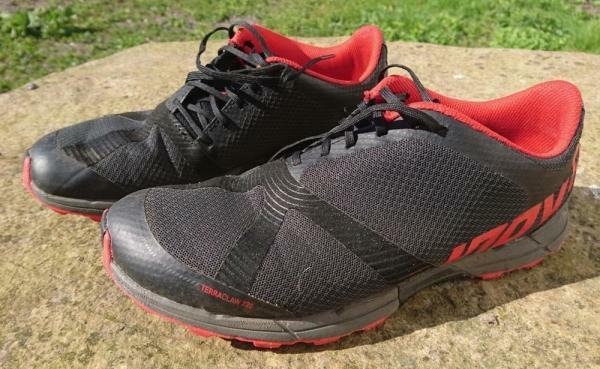 The Terraclaw 220 could almost have been designed specifically to suit taste for a trail shoes and aside from adding a toe rand, there is nothing at all I would change about them, they really are excellent. The Inov-8 Terraclaw 220 features an enhanced outsole that delivers an impressive grip through its sticky rubber compound and the multi-directional lug pattern. It compliments well to the foot’s natural movement and promotes debris release. The shoe also features an added drainage in the mesh upper. It allows greater breathability, keeping the foot cool and drier all throughout the run. The Terraclaw 220 is available in standard running shoe length and widths for both men’s and women’s versions. The forefoot, heel and midfoot are of standard measurements. This shoe gives comfortable fit to those medium and slightly wider feet. The Dual-C outsole element is used in the Terraclaw 220. It delivers maximum grip on varied terrains and added durability on high wear areas. The stick rubber also gives maximum grip on wet conditions for optimal running performance. The Meta-Flex groove is also a big help in delivering natural forefoot flex during toe-off. The shoe uses the injected EVA foam that absorbs shock and has reliable energy return properties for a resilient ride. The Dynamic Fascia Band is extended in the heel to the forefoot. It gives efficient energy return with every step and it delivers a powerful toe-off. The upper of the Inov-8 Terraclaw 220 uses a synthetic mesh that delivers a breathable and lightweight coverage. It keeps foot well ventilated all throughout the run. It also comes with a seamless RayWrap that keeps the foot in place while running. The toe cap protects the foot against bruising and the tongue prevents debris from entering the shoes. The shoe has an asymmetrical lacing that wraps the foot comfortably.